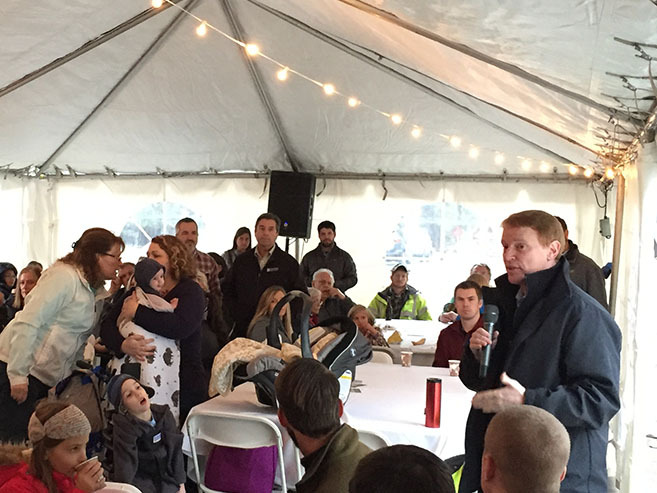 Oregon State Senator, Tim Knopp was in attendance at the First Place dedication. First of 13 homes in collaborative affordable housing effort to be dedicated in December. In response to Bend’s affordable housing shortage, numerous partners, including First Story, Hayden Homes, Building Partners for Affordable Housing (BPFAH) and the City of Bend, have partnered to create First Place in Southeast Bend, a community aimed at providing homeownership opportunities for local workforce families. Since 1998, First Story, a public non-profit founded by Hayden Homes, has built 65 homes across the Northwest for deserving families. First Place is the nonprofit’s first community effort, which will include 13 homes constructed over the next five years. The homes, located on Geary Drive off Parrell Road, will be sold to qualified applicants through First Story’s Home Buyer Program, which issues no-interest 30-year loans that require no down payment. The land development in First Place was made possible through a partnership with BPFAH and the City of Bend’s Community Development Block Grant (CDBG) Program, which works to address the needs of low and moderate income earners in Bend. A dedication of the first home at First Place will be held on Thursday, December 1, and will be attended by new homeowners Kristine and Greg Andrews, and their two young sons — one of whom requires a wheelchair. MEDFORD December 9, 2016 — Berkeley Hills by Hayden Homes has been selected for the 2016 Best of Medford Award in the Home Builder category by the Medford Award Program. Each year, the Chamber of Commerce and other affiliated community and small business supporting organizations identify companies that we believe have achieved exceptional marketing success in their local community and business category. These are local companies that enhance the positive image of small business through service to their customers and our community. These exceptional companies help make the Medford area a great place to live, work and play. Various sources of information were gathered and analyzed to choose the winners in each category. The 2016 Medford Award Program focuses on quality, not quantity. Winners are determined based on the information gathered both internally by the Medford Award Program and data provided by third parties.